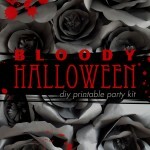 We are so excited about the release of our new Bloody Halloween printable kit! Okay, its only slightly bloody. Just bloody enough maybe? Anyway, we would love to help you decorate your next spooky party.